Above all else we should provide care, comfort, play and entertainment to a consistently high standard. We should be accessible, available and adaptable to meet the needs of sick children and their families in hospital and elsewhere. Active Volunteers supported by professional staff are our greatest asset. All our people should be trained. We must uphold the highest standards of ethics and integrity. We should work as part of the care team supporting the sick child. We should be fun for all involved. To achieve the highest quality of service delivery though appropriately trained and supported Volunteers. To develop our play and entertainment services for sick children in hospital and elsewhere. 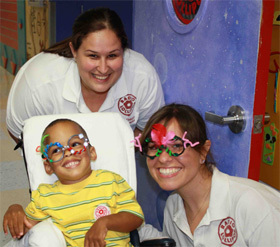 To promote the awareness of the importance of play for children in hospital. To develop co-operative partnerships with hospitals and other organisations with whom we work. To create the financial resources to achieve these aims.